When Veen Dee invited us to her wedding in Langkawi, I was really excited. Apart from being excited for her wedding, I was also excited for another reason: Elhan's first plane ride!!! I know it's funny but it was one of the most exciting days of my life that I was looking forward to! It was really exciting because Elhan is a jovial and cheerful little boy who gets excited and happy about the littlest things in life so I feel excited to see how he would react to being in an aeroplane. I can't deny that it was also quite scary and I was also a bit nervous in the days leading up to the plane ride. He wasn't even 10 months old yet. I was also quite worried if I would be doing anything wrong and didn't do enough to prevent him from being cranky or crying on the plane and disturb the other passengers. Yes, I KNOW it was just a domestic flight from KL to Langkawi. Yes, I also know it was just a 1-hour flight guys haha. But you know how moms are. Turns out I was worried about nothing. He turned out to be a really great baby passenger. Alhamdulillah. 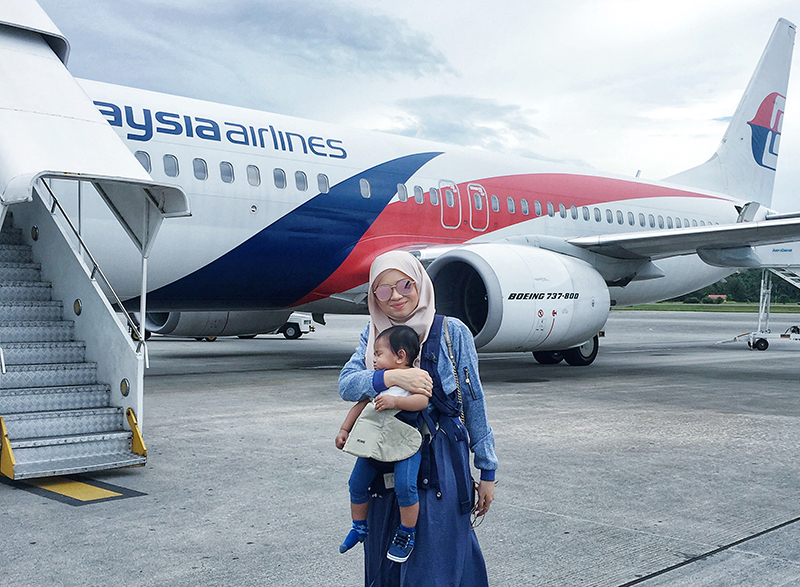 Anyways, after months of planning and going through the actually travelling with our son, I learned a few things from it so here in this post I'm sharing 13 things that I learnt from Elhan's first plane ride below. Elhan and Mama before we left to KLIA! As soon as we landed in Langkawi! He was fast asleep through out landing. Our superhero, Elhan's Abah as soon as we arrived at KL International Airport! 1. Make sure that he is well rested leading up to the travelling day. Don't bring him out too much or tire him out the days before the travel date. Normally I would take him out swimming 2-3 times a week, but on that week before his plane ride, I kept it to a minimum. 2. Ensure that his snacks are available at all times. Travelling is tiring for little kids. Keep plenty of snacks to avoid him being hungry. He should not be hungry. Make sure his meals are packed. We fed him before we left and then fed him during the journey on flight. In between, we gave him his snacks. 3. The timing of the flight is important. Try and get a flight that coincides with his nap time. Get there early so that we don't have to rush. I mean, when there are no kids involved its okay to rush but when there's a baby it can be quite impossible to rush. Think ahead about the timing as usually at some point he will be hungry when he wants to eat or drink milk. Plan whats going to happen during the day and the timing must revolve around him so that he has time to rest after the flight. So that day after we arrived we bathe him, let him rest and nap for awhile before going out for dinner. We didn't plan to do any activities but instead just stayed and enjoyed our time together in the room. 4. Pack well for the little one. It is better to over-pack (and boy did I overpack) than to pack less or not enough. I've never been one who packs light when I travelled alone before but with a kid packing was a whole new experience. Suddenly I packed light for myself and the focus of packing was more for him! We had the biggest bag just for him, plus his diaper bag, plus his stroller, plus his baby carrier and the list goes on and on. We bought diapers, food, outfits, milk supply, toys and all other necessities that could last him for many more days than the number of days we actually stayed there. Hehe. Khubayb and I shared a bag! That was a first. Usually I have 1 big bag for myself but since we had to let Elhan have all his stuffs and not leave anything behind Khubayb and I shared the smaller bag. 5. Check out the policies for luggage and carry ons. We had to leave the strollers at the plane door. We knew about this earlier so we prepared accordingly. So, we brought the baby carrier as well. However, the next time we fly, I think it would be easier to just check in the stroller from the beginning instead of leaving it at the door of the plane. (The husband did suggest it but I thought it would be easier to just bring the stroller along till we get to the plane). Even when we landed and after, he was still sleeping on me while I carried him using the baby carrier so there was really no need for the stroller even after we have arrived. I was also happy to know that the limited amount of liquids to be brought on hand carry did not apply to parents with kids. And the hand carry limit does not apply to us too. It's great that the airline is more generous and flexible when it comes to parents with babies, toddlers and kids. Thats one thing off our minds, especially since we need to bring milk, water and what nots for Elhan. 6. Feed, Feed, Feed. During take off and landing is when our baby will feel the ear pressure the most, so that is the time to feed him. When I was researching about how to make him feel mrs comfortable while flying, I found that the act of swallowing and sucking will help to ease the ear pressure. So when we were taking off I fed him with snacks and then when we were in the air we fed him his rice chicken porridge. Funnily enough E slept during landing and even when I carried him off the plane. Since I was carrying E, the husband carried all the many many other items including pushing the stroller. 7. Don't forget his toys. This is to fight boredom so that they won't cry. We brought along his favourite book and his spiderman toy which we stuck on the window to distract him. 8. Comfortable outfits. Comfortable outfits are a must, not just for the baby but for the parents too. The baby's clothes must be loose and comfy but be prepared for the chilly air-conditioning in the airport and in the plane. Bring a blanket or jacket for him just in case. 9. Consider taking another seat. Our active Elhan was at the stage where he couldn't sit still: he's always crawling around, standing and walking with support and while holding on to something. We were lucky because he was okay just sitting on our lap. Most of the time he sat on my lap. But for a few minutes when he sat with his Abah and was jostling about until the passenger sitting next to my husband started to get annoyed (apparently not everyone is into cute babies haha) and he did a stern "NO, NO" gesture to Elhan when Elhan was being his usual self and trying to say hi to the grumpy passenger. Yeah, really. In a few months time, I don't think he will want to just sit on our laps anymore. But since he is still under 2 years old might as well use up the privilege since we only need to pay about 10% of the whole fee! So, most probably in the future we will take another seat so that he can move about. I will also book the front-most seats which will have more leg space. 10. Change his nappy before boarding the flight. I read that it was important to board early as there can be a lot of things that might happen and you might end up missing the flight. So we did just that, arrived early and boarded early. So far, so good. But then there was a small downside. I was quite surprised that there was no nearby baby room once you pass immigration. We thought there was going to be a baby room inside, but there wasn't - so I had to change him in the toilet. And he was a handful to change as he wouldn't sit still. So I was lucky when I was changing him in the normal toilet without any area for him to change that I bumped into Sarah (who also happened to be going to the wedding on the same flight) and she kindly volunteered to help out to hold E while I changed him standing up haha. Thanks Sarah! I find that there are so many nice and kind strangers around too and even more so when you're travelling with a baby! 11. Be calm. Our emotions are infectious. If we get stressed, nervous or angry the baby can sense it and get similarly affected too. So we need to just breathe and relax. There is bound to be unexpected and uncontrollable things happening and sometimes it might be easier said than done. We need to accept that some things are out of our hands - and just be flexible and adaptable. Of course its easy for me to say now as E was so well behaved this time around and it was just a 1-hour ride. He wasn't cranky at all. So, God help me for my next trip on the plane! After I was done being a nervous worry wart for all the above points, but surprisingly when all of us were comfortably settled into our seats without any untoward incidents, I could finally be calm and relaxed and could enjoy the journey. It was actually pretty exciting, looking back. The hard parts were actually before we go into the plane itself. I even managed to record some of the moments in-between. Maybe I'll share it when I get the time to edit it. Hehe. It is definitely a milestone for E. I really savoured it. Phew! Will share more about the Langkawi trip soon. Probably I'll learn more things when we get to travel again next time, whenever that may be! If you're a parent who has travelled with your baby or kids before do share with this newbie some tips! Would definitely appreciate it. Thanks for reading and below are some photos throughout! E looks a little bit nervous? Naaaah, he was just sleepy on the way to KLIA. Look at that stroller and diaper bag! Wefie as soon as we passed the gate. We were one of the first passengers to get it because we have Elhan with us hehe. The view from above when we were about to reach Langkawi. Breathtaking. A quick family wefie once we are all settled and before we take off! This shot reminds me of my post back in early 2016, Jan last year Flying with the Wind. Khubayb captured OOTD shots of me on the runway. That was just about a month after my second baby loss. At that time, I feel like time was moving too slowly. And now, I feel like time is travelling too fast. We were so lucky that our transportation to the hotel was actually arranged by Veen Dee's family months back! Last but not least the exciting ride from the airport to the hotel!